Canopies and awnings are a great amenity to have if you’re a commercial business. For eateries, canopies provide outdoor shade for your diners; for retail establishments, awnings are a great way to brand your storefront; and for buildings of all types, the benefits continue to expound. If you have canopies or awnings, however, they’re going to need to be thoroughly maintained over time, to live up to your expectations of them. To assist you, Imperial Power Washing is pleased to provide canopy and awning cleaning in Richland, WA. We’ll remove dirt, dust, bird droppings, debris and other contaminants from your canopies, to keep them looking pristine, no matter what function they serve. In restoring your canopies and awnings to a like-new state, we’re also able to help improve the overall façade of your business, leading to a more positive perception of your facilities from people who may be prospective customers, as well as those who already are. Do you need canopy cleaning? Take a look at your business’ awnings and canopies. When was the last time you invested in canopy cleaning in Richland, WA? Even if your canopies look good, it’s important to have them cleaned. Some of the biggest detractors to your canopies and awnings are those you can’t see, which makes it important to have them cleaned regularly to prevent unforeseen buildups that might cause degradation. Moreover, if you have a business where canopies and awnings are used to the benefit of customers—such as a restaurant, coffee shop or other service-based business—keeping these sources of shade in top condition is paramount. Bird droppings, mold, mildew or dirt that accumulates will quickly come to be noticed in the eyes of your customers and they could quickly decide to take their business elsewhere! Clean canopies and awnings, however, are a credit to your business—best of all, they’re also only a phone call away when you work with Imperial Power Washing! If your awnings and canopies need a thorough clean, provided by experts who understand the importance of their function, contact Imperial Power Washing today by calling 509-438-4595. 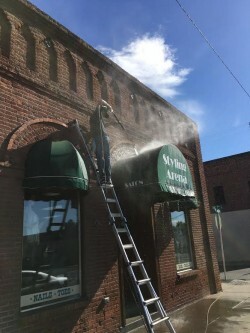 We’re happy to provide quotes on canopy and awning cleaning in Richland, WA.